Raise the ring under the knob and push the gear lever to the left then forwards. 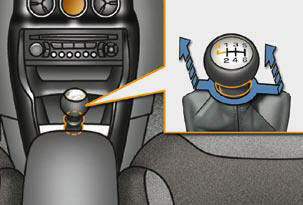 Only engage reverse gear when the vehicle is stationary with the engine at idle. - always select neutral, - press the clutch pedal.